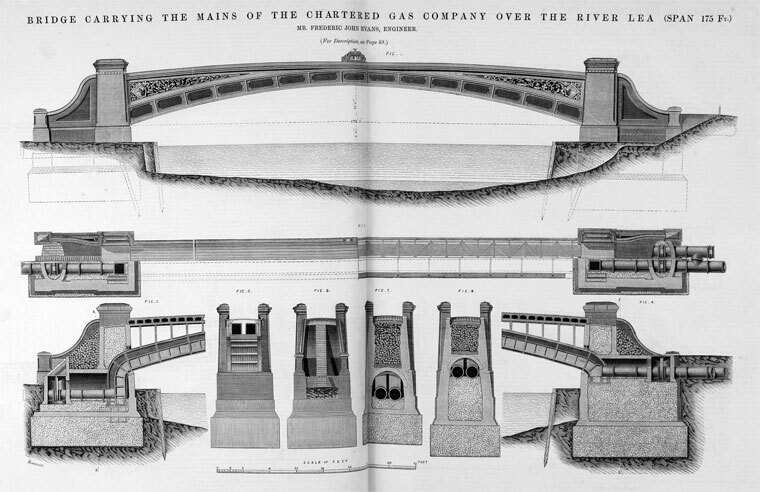 1870.Bridge Carrying the Mains of the Chartered Gas Co. over the River Lea. Frederick John Evans, Engineer. 1870. 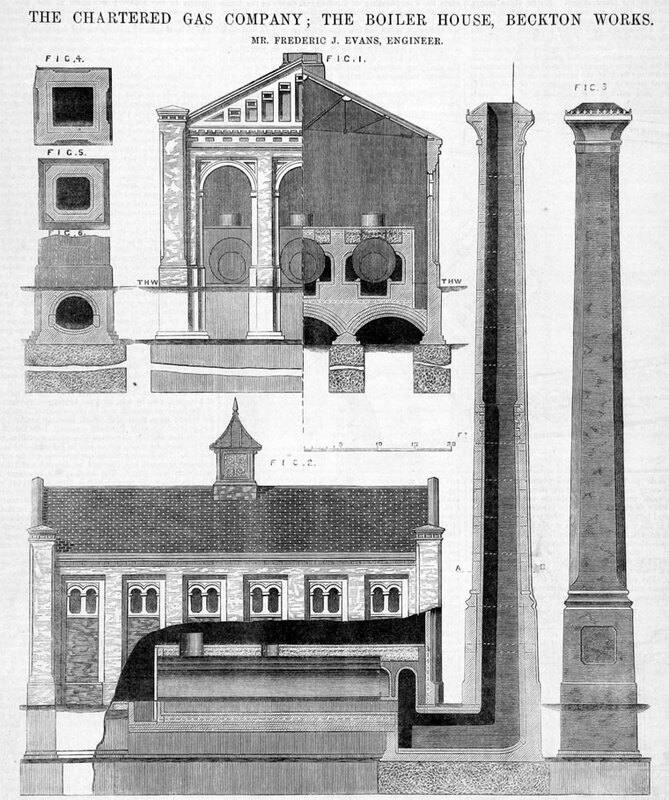 Boiler House, Beckton Works, Frederick John Evans, Engineer. 1870.The Exhauster House, Beckton Works, Frederick John Evans, Engineer. 1891. 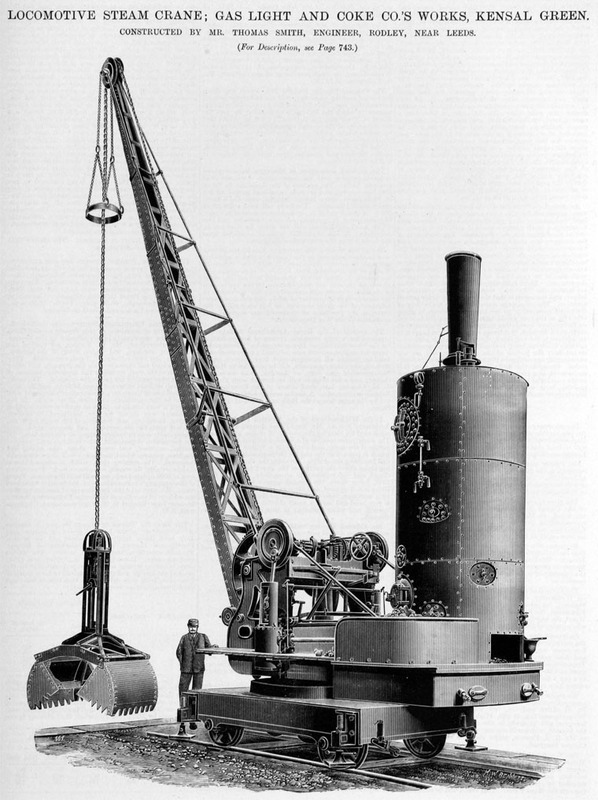 Locomotive Steam Crane. Constructed by Mr Thomas Smith. 1807 A committee was set up under J. L. Grant to promote Frederick Winsor's scheme for gas lighting in London but met opposition. Eventually Winsor overcame the obstacles and Parliament authorised the company. 1810 9 June: The Gas Light and Coke Company, commonly known as the Chartered Company, was formally established; James Ludovic Grant was its first governor. Winsor received the Royal Charter from the Prince Regent. This was the first major gas undertaking in the world. The company was to supply gas to the Cities of London and Westminster, the Borough of Southwark, and the adjacent precincts and suburbs. By 1812 the finance for the company had been raised. The first meeting of the Court of Directors was on 24 June 1812. The company (also known as the Westminster Gas Light and Coke Company and the London and Westminster Chartered Gas Light and Coke Company or the Chartered Gas Co for short) set up offices at 96 Pall Mall; a wharf and house were rented at Cannon Row, Westminster, which became the site of the works. 1813 On December 31, Westminster Bridge was lit by gas; the old oil-lamps were removed from St. Margaret's parish, and gas lanterns substituted; on Christmas-day, 1814, the general lighting of London with gas began. By 1815 30 miles of gas main had been laid in London but Winsor had been ousted from the company. He went to Paris and founded a small gas company there. Company moved to Peter-street, or Horseferry-road, then the site of a market-garden, poplars, and a tea-garden. 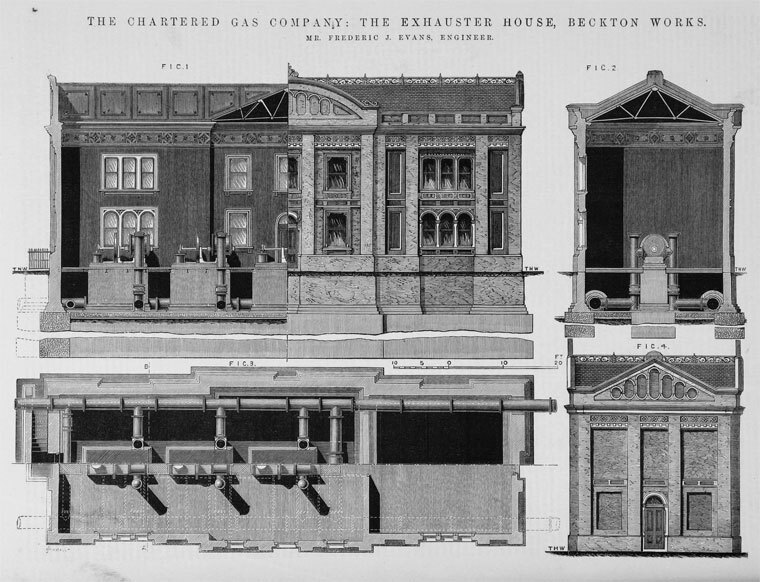 The Chartered Gas Light Company's first works were in Peter-street,Westminster, and Brick-lane, St. Luke's. 1815 Frederick Accum, Chief Chemist of the Company, had found that useful by-products could be derived from the tar; he used closed stills to produce a distillate substitute for natural turpentine. It was used as a solvent in paints and varnishes, and later for the public lighting of Waterloo Bridge and neighbouring streets. 1816 the Chief Engineer, Samuel Clegg, carried out some experiments on carbonising crude tar to make gas but these were abandoned in 1817. 1816 Thomas Dalton, a foreman caulker at the Blackwall shipyard of Wells, Wigram and Green, wrote to the company about possible applications for tar. As a result, the company employed Dalton as their sales agent for this material, principally used in caulking and rope making. 1817 the company decided to process all its crude tar itself, instead of selling it. Premises were leased at Poplar and a tar works was established at Orchard Place, near the junction of the River Lea with the Thames. 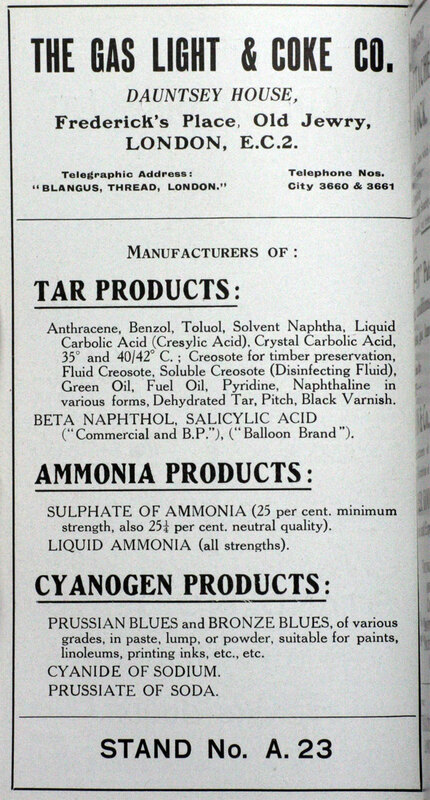 Thomas Dalton was appointed Superintendent and, during the next ten years, he developed and expanded Poplar Works and built up and promoted the range of products, which included pitch, refined tar, varnishes, oils, paints and lamp black. 1818 The company leased premises at Orchard Street, Poplar, to establish a tar works; the Brick Lane and Westminster works began their own ammonia products works so the company could make the most of coal burning by-products. By 1819 nearly 290 miles of pipes had been laid in London, supplying 51,000 burners. By 1820 at least 20 independent provincial companies had been established. At some point Poplar works was sold as a going concern to Turner, Shackell and Hopkinson, who continued to buy crude tar from the company. 1840 the Poplar premises reverted to the company; tar distillation may have ceased then, but Turner was still at the works in 1853, making "varnish". 1841 The Chartered Gas Light and Coke Co had premises at 10 New Bridge St; Horseferry Road, Westminster, Brick Lane, St Lukes; Curtain Rd, Shoreditch. but, unlike most of the other gas companies, none of these works were served by water or railway. 1860s There had always been difficulties in transferring coal into the principal works, at Westminster, from ships in the Thames. Combined with the increased production of gas, the company decided to build a larger and more accessible gas-making facility, where colliers could be brought right up to the works at Gallions Reach, Barking, Essex, on the north bank of the Thames. Gas would be taken to central London by a trunk main. 1868 Constuction began at what would be called Beckton Gasworks. Beckton was several miles from the nearest village, East Ham. The company built a small village beside the road into the works for key operators; this included churches, shops, a post office and a public house. 1870 Production started at Beckton. The company then decided to process its tar and ammonia by-products. Within a few years Beckton Products Works was built on a site adjacent to the gas works. Another by-product, coke, was sold to a wide domestic market. The rapid expansion of the Gas Light and Coke Co led to the need for a large transport fleet. Every type of transport was used and usually owned by the company. Shipping, barges and railway engines were often used for the import and export of coal and by-products at the works. Road transport ranging from horse drawn carts to wagons catered for other supplies and maintenance needs. 1872 Five men were jailed for twelve months following a strike at the Beckton works in support of two workers sacked for requesting a pay rise. The sentence was subsequently reduced to four months. 1889 Men were laid off from Beckton, prompting the founding of the National Union of Gasworkers and General Labourers, which subsequently became part of the General, Municipal, Boilermakers and Allied Trades Union (GMB Union). The expansion of the company and competition from electricity in the late 19th century, led to development of the domestic market. Lady Demonstrators were employed to promote gas cooking and the Home Service eventually developed into a full advisory service on domestic gas use. 1899 As a large employer, the company took its social obligations seriously and provided various pension, sickness and benefit funds. Links were established with the Territorial Army and by the time of the Second Boer War in 1899, company employees were eligible for duty as reservists and volunteers were given leave of absence. 1912 A very large self-trimming collier, Fulgens, was built by Wood, Skinner and Co for Gas Light and Coke Company. 1926 The new coal handling plant at Beckton Gasworks opened by His Majesty The King who was accompanied by the Queen. 1949 The company was so large that after nationalisation of the gas industry in 1949 the area it covered, which stretched from Pinner in North West London to Southend-on-Sea in Essex, became North Thames Gas, one of the twelve regional Gas Boards. It is identified as the original company from which British Gas is descended. This page was last edited on 31 July 2018, at 16:38.